With illustrations that recall old film stills, Chris Van Allsburg’s latest children’s book, “Queen of the Falls,’’ recounts the true story of a 63-year-old widow who, in 1901, became the first woman to go over Niagara Falls in a barrel. 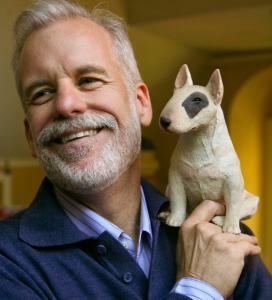 Van Allsburg, the Caldecott Medal-winning author and illustrator of “The Polar Express’’ and “Jumanji,’’ trained as a sculptor at Rhode Island School of Design. He spoke to us from his home in Providence. Your previous books have been fiction. To research this nonfiction book, what did you read? I first read about Annie Taylor around 1972 or ’73. I was working in a little factory that had a stack of old Sports Illustrateds in the lunchroom, and I read an article about the daredevils of Niagara Falls. That was how I learned that the first person to go over the falls was this retired charm-school teacher. About a year and a half ago, I thought it would be interesting to write about an eccentric American as a way of telling a story about America. And from the recesses of my memory came this recollection of Mrs. Taylor. I went to my local library, which is connected to other state libraries, and they had very little information about her. Most of the books I used as reference were about Niagara Falls. Though there was one book — it was spiral-bound and came from a little library up in Maine, kind of a monograph — that had a fair amount of information about Annie. I read fiction, nonfiction, The New York Times. The last book I read was “Room.’’ Before that was “Operation Mincemeat.’’ I liked them both. I’m decorating a house now, so I’m into all these old books about English Arts and Crafts and William Morris. Of the many volumes in our house, maybe 15 percent are architecture books: big coffee-table books on Voysey, Baillie Scott, all these Arts and Crafts architects. To paraphrase the title of a book my wife just finished — “The Emperor of All Maladies’’ — I think of architecture, especially home architecture, as the emperor of all art. In your transition from sculpture to illustration, what authors inspired you? When I was making sculpture, I had a studio that was inhospitable to evening work in the winter, because the landlord turned the heat off. When you’re young and full of creative energy, there’s no reason to stop working. So I would keep working at home, and draw pictures. My wife, who used picture books to teach elementary-school art, said, “You should think about doing book illustrations.’’ To prove her point, she brought home a stack of books for me. Almost all the books were illustrated with this naïve, childish, unsophisticated picture making, as if art directors had embraced the idea that children’s books should look like they were illustrated by children. But there was one book that stood out, which was “Higglety Pigglety Pop!’’ a Maurice Sendak title. “Higglety Pigglety Pop!’’ looked like art. It’s small, and it’s illustrated with these delicate, atmospheric images, these cross-hatched pen drawings. In Maurice’s oeuvre, it’s a slightly more modest book. But it was the one that enlightened me about what a book could be. The one I remember most clearly was “Harold and the Purple Crayon.’’ Harold could make things with a purple crayon that would instantly have reality. He could draw a little boat and sail away. For a child, it’s a fairly empowering fantasy. And it’s an empowering fantasy for an adult artist, to pick up a crayon and make something real.